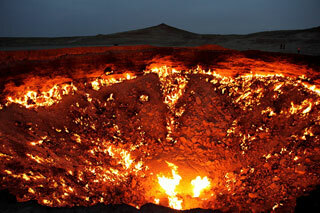 The Darvaza gas crater, known locally as the "Door to Hell" or ''Gates of Hell", is a natural gas field that collapsed into an underground cavern, becoming a natural gas crater. Geologists set it on fire to prevent the spread of methane gas, and it has been burning continuously since then. The gas reserve found here is one of the largest in the world. The name "Door to Hell" was given to the field by the locals, referring to the fire, boiling mud, and orange flames in the large crater, which has a diameter of 70 metres. This article uses material from the Wikipedia article "Darvaza Gas Crater", which is released under the Creative Commons Attribution-Share-Alike 3.0 License.